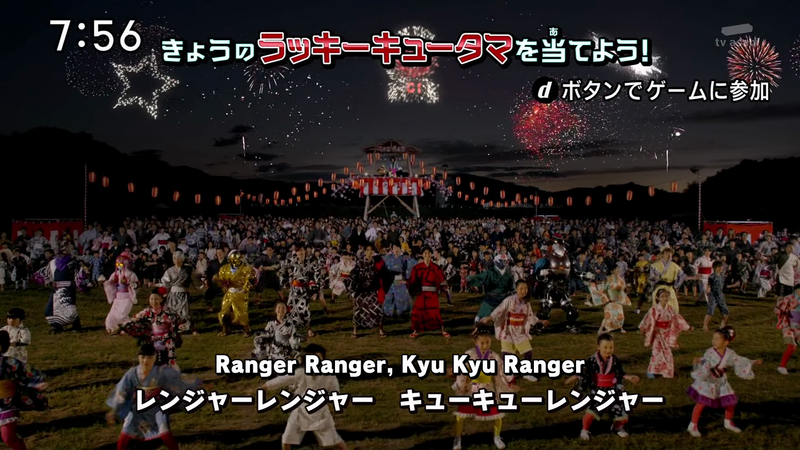 Is it a coincidence or done on purpose that this week's Kyuranger is on historical revisionism? Today is the 2nd SONA of President Rodrigo R. Duterte. 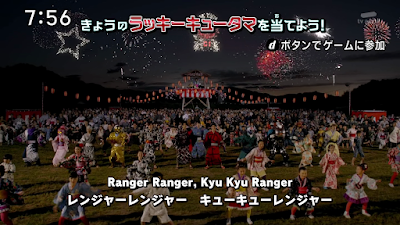 Kyuranger may be a Japanese show but it's funny how Filipinos may actually be given a wake-up call against historical revisionism. With Japan and the Philippines as important allies let this review rip off the Empire of Aquino! This episode focuses on Ohtori Tsurugi. So he's been asleep for 300 years or what? If Zyuohger was in 2016 I'd assume this series takes place in 2317. So what if the black hole that Space 18 had was a time space warp, pun intended. Since Tsurugi was asleep for centuries so think about how much he's missed. 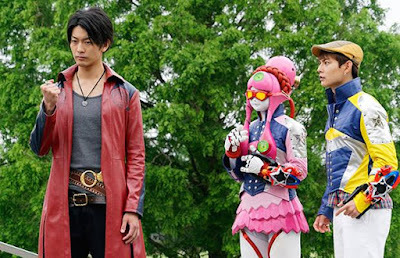 I don't think he even knows about the legend of the other Kyurangers or that he may be destined to fight with them. It's also revealed he supposedly killed Don Armage centuries ago but how is the tyrant alive and kicking? 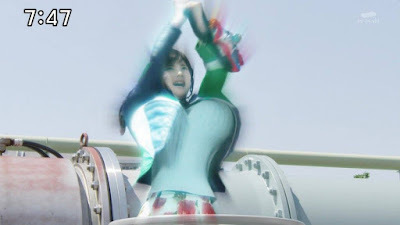 A power-up known as the Hercules Globe. Okay, I'm not finding this joke on Hammy to be funny. She could have just gained super strength without the bad joke. 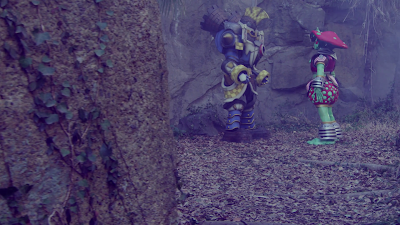 Anyway, the Kyurangers were trying to stop a Consumarz from destroying the Earth. It's nice to think how Hammy gets to use her brain and brawn in one episode. 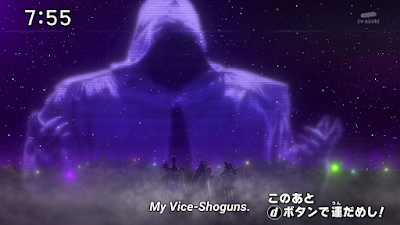 Gigant Houou reveals itself to be the latest mecha of the show. I love its cool rocket ship/phoenix hybrid design. What's impressive is how the burning flame sword is used once again. 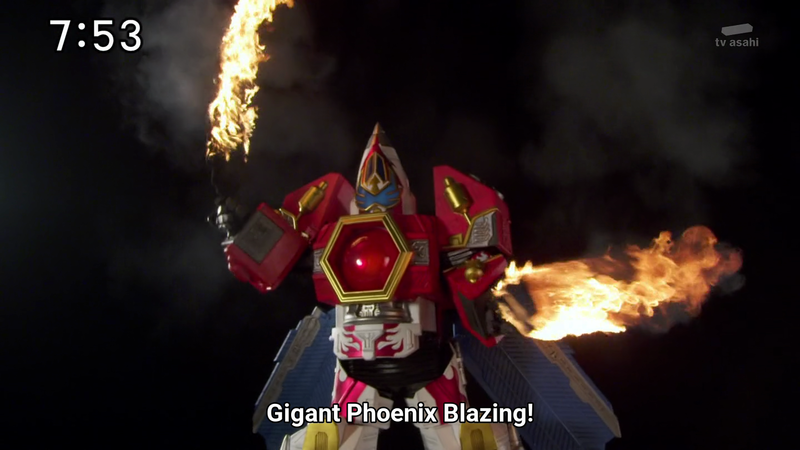 What disappointed me back in 2009 is that Shinkenger didn't try to combine both real flames and CGI flames. It was impressive to have some real flames before the CGI flames are used for the rest of the fight. It's always nice to combine both old school and new school methods whenever it's possible. 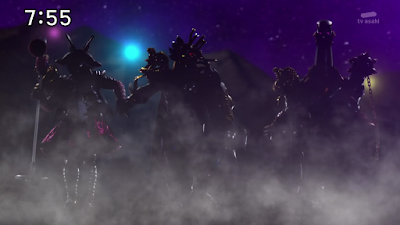 At the end of the episode, three new shadowy figures show up. I have a feeling that we may be getting into something new. 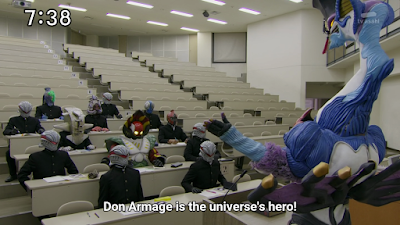 Don Armage is pissed that his propaganda was destroyed. 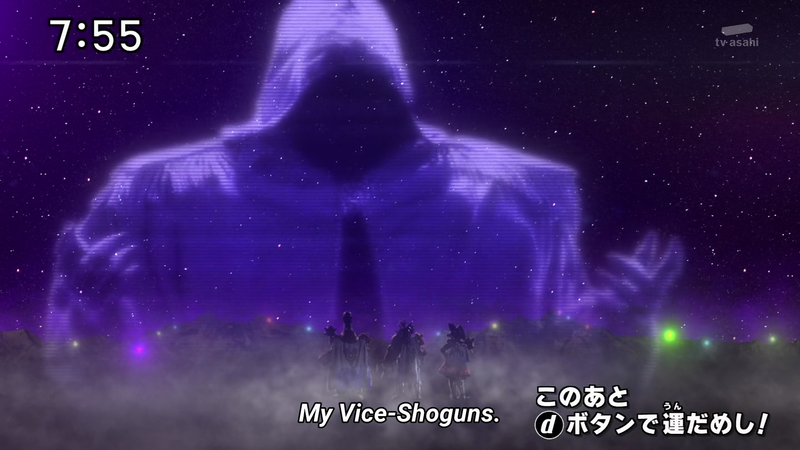 He's desperate and it looks like he's going to use his Vice Shoguns to get rid of the Kyurangers. I guess it's his desperate attempt to make sure that the real history of the Universe isn't shown. 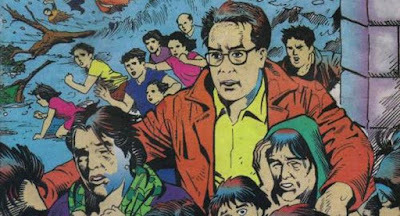 Doesn't that sound like the Aquino Empire conspiracy? It's nice to have a summer dance at the end of the credits. 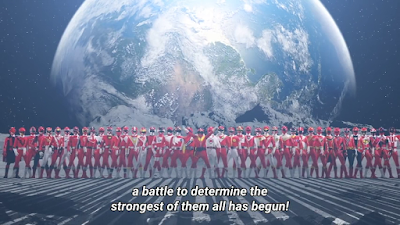 I love the change of pace the ending theme has taken from the regular ending theme. I'll enjoy it while it lasts. Next week will try to develop more of the clash of ideals between the Kyurangers and Tsurugi. 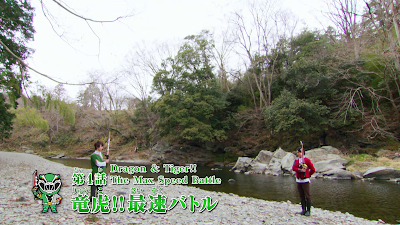 Just for a bit of pun intended I wish that Change Dragon's actor Haruki Hamada will make a guest appearance. 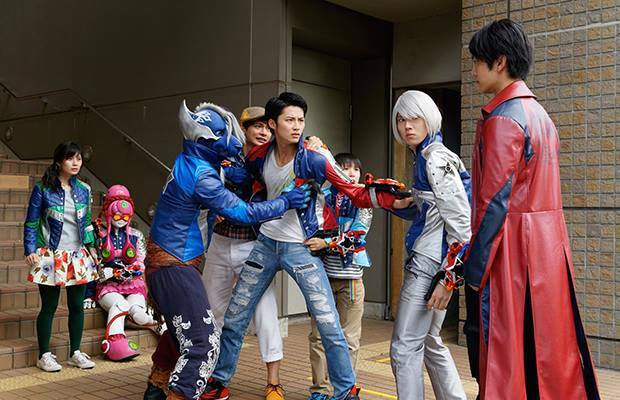 Kyuranger 20: A Friend Closer Than A Brother?